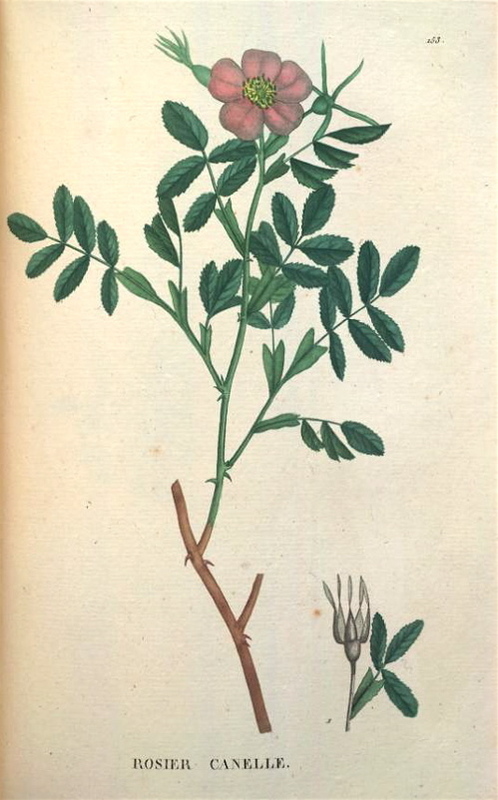 Hortus Camdenensis | Rosa majalis Lindl. The pale or bright red flowers of the ‘Cinnamon Rose’ are solitary or 2-3 together and borne in the summer. Shrubby, it grows to 2m. [Gore, Willmot]. George Don reported in his General System of Gardening and Botany that double flowered varieties were more common in gardens. In the early- to mid-19th century Rosa majalis was usually regarded as a separate species from Rosa cinnamonea, with solitary pale red flowers. Introduced into cultivation in the 17th century or earlier. Saint-Hilaire Tr. pl.153/1825. Rosa cinnamomea of Redouté (c.1817) = Rosa rubrifolia Villars. Rosa cinnamomea Herrm. = Rosa alpina L.
Rosa cinnamomea Kar. & Kir. ex Desegl. (1874) = Rosa dissimilis Desegl. Rosa cinnamomea Roth (1788) = Rosa eglanteria L.
More details about Rosa majalis Lindl. Northern Europe including parts of England.